A critical component in maximizing the profitability of any beef feeding program is being able to identify feeds that provide the required nutrients at a good price. BioZyme® Inc., experts in all-natural livestock nutrition, has created a FREE online tool for cattle producers that estimates feed values based on feedstuff nutrient content and current market prices. BioZyme’s Feed Barometer utilizes a software program designed by Dr. Normand St-Pierre and his colleagues at Ohio State University to evaluate multiple feed ingredients for a selected group of nutrients. For its Feed Barometer, BioZyme has selected Crude Protein (CP), Net Energy for Gain (NEg) and Effective Fiber (eNDF) as the most important nutrients driving the feed ingredient value for beef cattle. The software program uses multiple ingredients in its appraisal set to reflect current market conditions, therefore avoiding the risk of basing evaluations on just a few ingredients. Producers can access the online tool by visiting BioZyme’s website (www.biozymeinc.com) and selecting its VitaFerm® brand product pages located at http://vitaferm.com/regional-feed-barometer/. 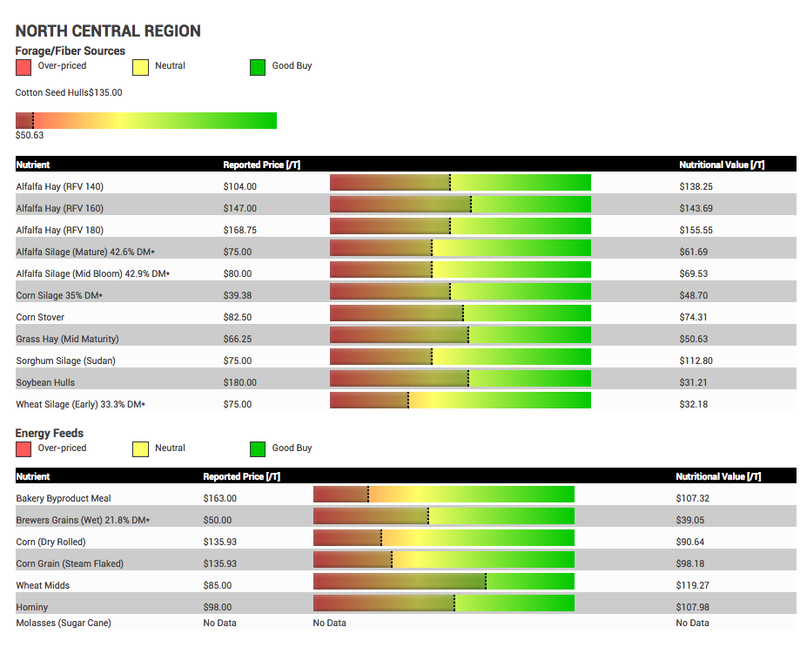 The system shows the reported price and nutritional value for each nutrient in that region, then calculates through a sliding graph whether the feed is considered “over-priced,” “neutral” or a “good buy”. The prices represent wholesale commodity prices, and generally do not include freight or added value from a feed manufacturer. Additionally, BioZyme provides a Feed Market Synopsis each month on its Feed Barometer page, as well as online links to the following valuable resources: federal cattle markets, feeder cattle markets, cattle futures, regional feed market info. and weather reports.